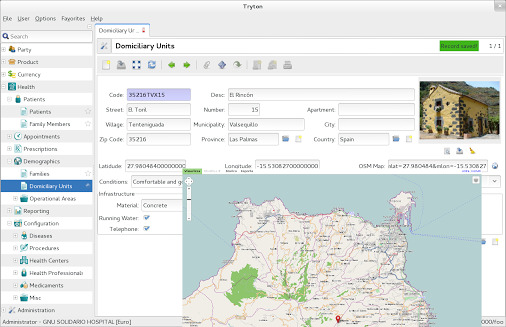 This is a new feature of the upcoming GNU Health version 2.0: GNU Health is now fully integrated to OpenStreetMap ! It can visualize the exact location of any Domiciliary Unit in your operational sector around the world. Thanks to the OSM integration, we can now early identify disease outbreaks, improve epidemiology and demographic studies and many other actions to improve public health. Una nueva característica en la próxima versión de GNU Health 2.0: GNU Health integrado a OpenStreetMap ! De esta manera podremos visualizar en tiempo real la Unidad Domiciliaria de cualquier lugar del planeta. Nos permite la detección temprana de brotes epidémicos, visualizar rutas de acceso en zonas rurales, hacer estudios demográfico y, sobretodo, mejorar la Salud Publica. 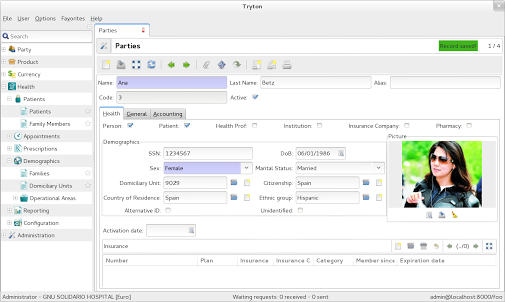 The upcoming GNU Health version 2.0, will come with a new demographics section. This will improve and speed up data entry at the front desk, and differentiates individual vs patient information. It will also improve data collection for better Primary Care campaigns.